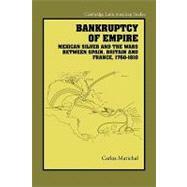 Bankruptcy Of Empire: Mexican .. The Spanish crown was involved in four wars with Great Britain and two wars with France during the decades 1760-1810. Colonial Mexico financed most of these wars by remitting silver in the form of taxes and loans. The expenditures of the imperial wars were so great that they eventually caused the bankruptcy of both the Spanish American colonies and of the monarchy itself.